How to Make The Perfect Cup of Espresso! I recently visited Miami and tried Cuban coffee for the first time. It was a life changing, amazing experience and such a beautiful culture surrounding this beverage. 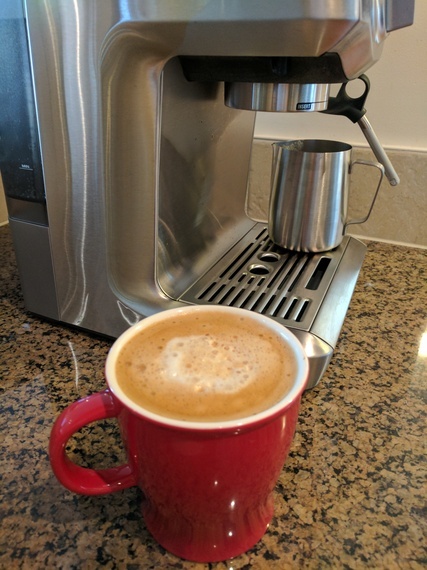 Recently, I was lucky enough to speak with Breville Canada’s Senior Category Manager – Beverage, Gabriella Russo and Gabriella shared her top tips on how to make the best espresso. What are the best tips to make amazing espresso? · For true café quality, freshness is everything. Using freshly roasted quality beans 5 to 20 days after the roasting date is the first step in achieving an amazing espresso. · Balanced espresso requires the right dose each and every time: 19-22grams of coffee will deliver a perfect double espresso shot. · Coffee must be tamped to be perfectly level for a balanced extraction. · Water temperature needs to be precise and consistent for optimal espresso taste. 196-200 degrees, +/-2degrees, is the optimal water temperature to extract an espresso. · Importantly, Low pressure Pre-infusion evenly expands coffee grinds for an even extraction. · Maximum flavour potential is achieved when espresso is extracted between 8-10 bars of pressure. When too much pressure is used, bitter flavours dominate the cup. When too little pressure is used, the result is a thin crema – leading to poor mouthfeel. What are the most common mistakes that people make when making espresso? · Checking the roasted on date before buying coffee. Never rely on the ‘’Best Before’’ or ‘’Use By’’ date as a guide to freshness. And always try to grind on demand, just prior to extraction. This way you will capture all the delicate aromatics of the coffee. Sacha (author) making the best cappuccino! What are the best tips for amazing milk foam for either a latte or cappuccino? When frothed correctly, milk looks like wet white paint with a consistent texture from top to bottom. The right texture (commonly referred to as micro-foam) isn’t just nice to look at. The thousands of tiny bubbles within the milk entrap the oils of the espresso and burst on the tongue to enhance flavour and mouth feel. Creating micro-foam is a challenge even for the professional barista. It requires introducing the right amount of air, integrating it evenly throughout the milk, as well as frothing to the right temperature. Above 65°C milk fats start to separate from the proteins in the milk, creating a watery layer and making micro-foam impossible to achieve. Ensure the milk and the milk jug are both cold before texturing the milk. What to look for in an espresso maker? It really depends on what the consumer is looking for. Look at a variety of espresso machines at different price points, that can deliver the café quality results you are looking for. – A machine that can deliver precise water temperature of 196-200 degrees +/-2degrees. How to maintain your espresso maker (so it lasts a long time)? Keeping the tip of the steam wand clean is essential maintenance for long-term, great performance, from your espresso maker. Simply wipe the outside of the wand and the tip with a clean damp cloth after each use. Use filtered water to help reduce impurities and excess minerals from entering the machine. Depending on the hardness of your drinking water, descaling is recommended for removing mineral deposits from the machine’s internal water paths to ensure optimal performance. I am going to use these espresso tips, if you have any espresso or coffee questions, please let me know and I will do my best to find the answers for you. Your suggestions are always welcome as I continue to enjoy life to the fullest!